There are very few productions I’ve seen that make me gasp out loud or sit, wide-eyed in childlike wonderment. BRIEF ENCOUNTER is one of these plays. It engages the heart and mind. It’s a vintage love letter and a Vaudevillian magic trick all rolled into one. It’s a step back in time. 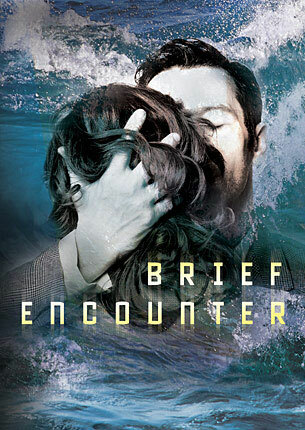 BRIEF ENCOUNTER comes to Broadway* with a British pedigree, thanks to director Emma Rice and the Kneehigh Theatre Company of Cornwall, England, who conceived and created the production. The show is an adaptation of the film (of the same name, directed by David Lean) and based on Noel Coward’s short one-act play, “Still Life.” To recap: Noel Cowards short play begets Noel Coward’s movie begets full-length stage production … with music by Noel Coward. Fun side note: BRIEF ENCOUNTER (the film) was also the inspiration for Billy Wilder’s movie, THE APARTMENT, which became the musical PROMISES, PROMISES, currently in revival on Broadway. The most endearing quality about this production is its utter uniqueness. You won’t see anything else like this on Broadway. It’s vibrant, beautiful, and smart. There are amazing low-but-feel-high-tech special effects that lend a Michel Gondry/Spike Jonze/Jean-Pierre Jeunet quality to the production, which give it a whimsical, yet cinematic feel. The production’s cast perform duties as special effects artists and musicians, in addition to their parts in the production. No one really has a supporting role in BRIEF ENCOUNTER as each actor is so completely entrenched in their role, and their attention to detail is such that, you feel equally invested in every character’s story. Get swept away in the romance, the fun, and the wonderment. You will not be disappointed in this theatrical love letter. Stick around after the show because the company continues to charm you with their musical talents and good humor by performing songs (like “Don’t Stop Believing”) in the back of the theatre and dancing with the audience. It’s a convivial setting and an extra treat for the audience. And, if you are in New York, their next production, an adaptation of THE RED SHOES, will be at St. Ann’s Warehouse this winter. Do. not. miss. it. *Full disclosure: I originally saw BRIEF ENCOUNTER last winter, when the company brought their stateside tour to St. Ann’s Warehouse in Brooklyn.